TERRE HAUTE, Ind. -- Four seniors have been recognized for their achievement and service to Indiana State University with Alan C. Rankin awards. Named for ISUÃ¢â‚¬â„¢s seventh president, Alan C. Rankin, who served from 1965-1975, the Rankin Awards are sponsored by the Student Alumni Association and the Office of Alumni Affairs. 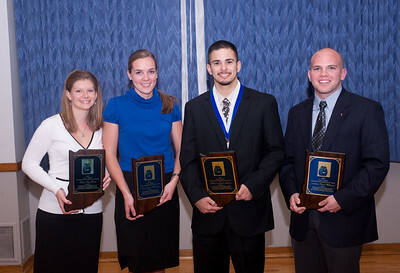 The awards were established to recognize outstanding members of the senior classes who have contributed to the betterment of campus life at Indiana State. Individuals selected to receive the awards must have a cumulative grade-point average of at least 3.25 and have demonstrated dedicated membership and leadership ability in campus organizations, as well as in the community. Sadie May Davis, Amy Huntsinger, William Jackson and Andrew Willmann will receive the Alan C. Rankin Memorial Distinguished Senior Awards during commencement exercises at 2 p.m. May 9 in Hulman Center. Davis, a political science, legal studies and womenÃ¢â‚¬â„¢s studies major from Martinsville, is active on campus, serving as opinions editor and a columnist for the Indiana Statesman, working with the University Honors Program, mentoring freshman students making the transition to college and participating in the American Democracy Project. She has also participated in a number of community activities, including the Martin Luther King Day of Service, Hull House Service learning Trip, Take Back the Night, Global Youth Service Day and World Food Day. In addition to her studies on campus, Davis learned about politics first hand by attending the 2008 Democratic National Convention. She studies abroad for one semester in San Jose, Costa Rica. Huntsinger, a public relations and marketing major from Frankton, is currently serving as the student member of the Indiana State Board of Trustees as well as president of Chi Omega Sorority. She has been very active on campus, working as a learning community peer assistant, and as a member of the Leadership Training Taskforce, National Society of Collegiate Scholars, Student Government Association and Alpha Lambda Delta. As a member of the Board of Trustees, she was involved with the selection of Indiana StateÃ¢â‚¬â„¢s 11th president, Daniel Bradley. She has participated in a number of community service activities such as Relay for Life, Hull House Service learning trip and Alternative Spring Break in addition to volunteering with Make-A-Wish Foundation and serving on the planning committee for ISUÃ¢â‚¬â„¢s Heart to Heart event, a heart education program. In addition to her studies, she has served as an intern with the Indiana State University Foundation, assisting in event planning and working as a nanny for a local family. Jackson, a chemistry major from Indianapolis, has been involved in campus activities as well as helping fellow students studying science. He is a member of the American Chemical Society, College Mentors for Kids and the Pre-Pharmacy Club and is chairman of academic/financial affairs for the Student African American Board (SAAB) and works as a tutor, teacherÃ¢â‚¬â„¢s assistant, lab assistant and student researcher. He served an internship at St. Elizabeth Medical Center in Boston and was the leader of pharmacy for the Cultural Maya Medical trip to San Pedro, Mexico in 2007. Jackson, a student in the University Honors program, served a fellowship in the biology department and was a supplemental instructor for anatomy in 2007. Willmann, a criminology major from Hartford City, has earned numerous awards and honors at Indiana State, including the Pi Kappa Alpha Service Award, Outstanding Junior Award and induction to Alpha Lambda Delta, Order of Omega, Omicron Delta Kappa and Golden Key honor societies. On campus, he has been active in Pi Kappa Alpha fraternity, Indiana State University Cycling Club, InterFraternity Council, presidentÃ¢â‚¬â„¢s Scholar Association and University Honors Student Association. Willmann, an Indiana High School Athletic Association wresting official, has given up his Spring Break for the past four years, opting to participate in Indiana StateÃ¢â‚¬â„¢s Alternative Spring Break. He has participating in fundraisers such as Special Olympics IndianaÃ¢â‚¬â„¢s Polar Plunge, Relay for Life, Race for the Cure, the MS Walk, March of Dimes Walk-a-thon and Rent-a-Pike, supporting the American Cancer Society. Four seniors have been recognized for their achievement and service to Indiana State University with Alan C. Rankin awards.